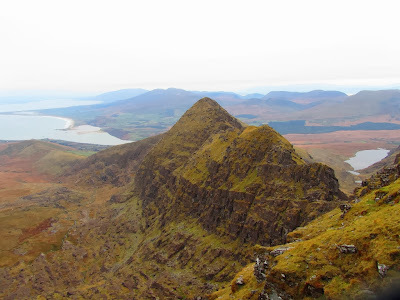 Ireland boasts 13 delectable Furth Munros - a Furth being a mountain outside, or ‘furth’ Scotland but high enough to have been a proper Munro were it lucky enough to reside within Scotland. See Dave Hewitt’s account of the history of this term here; broad discussion here. Based on my visit earlier this week, this post aims to help the Furth-bagger with the summary logistics, a taste of the routes, and pointers to detailed route descriptions as they are not included here. My favourite Irish Furths are Brandon Mountain with its commanding views over the sinuous and convoluted coastline of Dingle; and the 10 summits spiking along the sometimes knife-edged ridgeline of Macgillycuddy’s Reeks (a ridge that invites you to risk traversing its full length in one go despite the fact that the preferred 10 hours of visibility does not fit into the 8 hours of sun up in early winter). This animation shows how the British Isles were created from the collision of two entirely separate tectonic plates, and how Scotland itself was assembled from a jigsaw of many pieces.